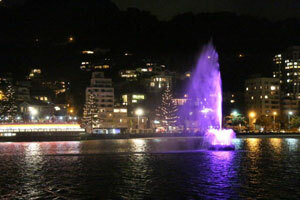 With cruises available all year round, host your next function on board one of our two ferries. Please check out our options below. Book any of the below cruises for your Christmas Cruise this year but do book early to avoid disappointment as we do always sell out. It’s the best Xmas party around and our clients keeping coming back! If you’re tired of the regular restaurant routine, then come on board and let our friendly East By West crew work their magic with you! We’ll show you a Wellington you haven’t experienced before! Our nights are informal and fun and everyone mixes. No top tables here! Perfect for birthday parties, staff functions and corporate or social events. There is something for everyone so do give us a call on 04 499 1282. Our old favourite for those wanting a full-on evening of music, food and fun. We have a superb sound system onboard with party music for entertainment and dancing - or bring your own music! During the cruise around the harbour, you will be served a delicious buffet banquet and of course the bar is open for your choice of wine, beer and spirits. Hors d’oeuvres will be served as soon as the ferry sets sail with a continuous open bar for drinks. After dinner, the music is in action with plenty of dancing and our onboard stereo and party lights. If you have any special requirements or requests, please let us know and we will be happy to oblige if possible. Cost $59.75 per head inclusive of cruise and buffet dinner. On Fri & Sat during Nov & Dec, minimum 35 guests. Departs Queens Wharf 8.15pm or 8.45pm on weekdays and anytime from 5.30pm weekends (subject to availability). We’ve teamed up with the best casino operators in town and this will certainly be a night for your staff, colleagues or social club to remember. Our our croupiers will be at the tables awaiting your bets! You will you enjoy a superb buffet meal on board and our fully licensed bar will be open to whet the appetite for the play gambling fun. All guests will be issued with play gambling chips on boarding and you can try your luck at the tables. Cost $72.50 per head inclusive of cruise, buffet dinner and casino fun. On Fri & Sat during Nov & Dec, minimum 50 guests. The newest edition to our Charter options are our curry cruises - perfect for warming you up on those colder winter evening cruises!We have teamed up with Mahajaras Indian restaurant to offer a 2 course buffet meal (also options to increase to 3 course meal). The starters and mains will be available throughout the cruise and are kept hot in bain maries. See sample menu for this cruise here. Contact us to learn more about food options. A great way to treat your team, entertain your clients, or perhaps launch a new product! We’ll take you on a lunch time cruise of our magnificent harbour that you won’t forget! If you are just looking for a special cocktail hour, perhaps before dinner in town or as part of a mystery tour, then this is the one for you. 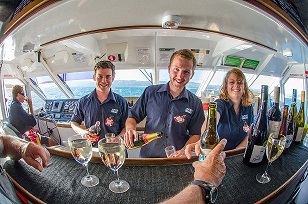 You’ll be served hors d’oeuvres on board while you tour the harbour in the comfort of our spacious catamaran and our fully licensed bar will of course be open to serve your drinks. Cost per head $42.50 inclusive of cruise and hors d’oeuvres. Please note cocktail cruise refers to cocktail style food not drinks. Another option is to hire the boat by the hour, which doesn’t include food. We have a great selection of music and food options available on a per head basis, ranging from nibbles to a full meal, which can accompany the cruise. Or you are more than welcome to organise your own catering if you wish, with this option. Weddings, birthdays, social functions, we’ll put together a cruise to suit! The ferry accommodates up to 65 guests on catered cruises. A deposit of 30% is required to confirm a cruise. Confirmed numbers at the time of deposit may decrease if notified before catering order is processed but in no circumstances can numbers drop below the minimum required. The balance of the cruise payment is required on or before the night. The bar can be run on a tab to be paid at the end of the evening or on a pay-as-you-go basis.